Pacemaker. Image credit: Medtronic . Cross-section of the chest with a pacemaker. Figure A shows the location and general size of a double chamber, or double lead, pacemaker in the upper chest. The wires with electrodes are inserted into the right atrium and ventricle of the heart through a vein in the upper chest. Figure B shows the electrode electrically stimulating the heart muscle. Figure C shows the location and general size of a single chamber, or single lead, pacemaker in the upper chest. The wire with the electrode is inserted into the right ventricle of the heart through a vein in the upper chest. A pacemaker is a small device that's placed under the skin of the chest or abdomen to help control abnormal heart rhythms. This device uses electrical pulses to prompt the heart to beat at a normal rate. Pacemakers are used to treat heart rhythms that are too slow, fast, or irregular. These abnormal heart rhythms are called arrhythmias. Pacemakers can relieve some symptoms related to arrhythmias, such as fatigue (tiredness) and fainting. A pacemaker can help a person who has an abnormal heart rhythm resume a more active lifestyle. The heart has its own internal electrical system that controls the speed and rhythm of the heartbeat. With each heartbeat, an electrical signal spreads from the top of the heart to the bottom. As it travels, the electrical signal causes the heart to contract in an organized manner and pump blood. Electrical signals normally begin in a group of cells called the sinus node. As these signals spread from the top to the bottom of the heart, they coordinate the timing of heart cell activity. First, the two upper chambers of the heart, called atria, contract. This contraction squeezes blood into the lower chambers of the heart, which are called ventricles. The ventricles then contract and send blood to the rest of the body. The combined contraction of the atria and ventricles is a heartbeat. Pacemakers also can monitor and record the heart's electrical activity and the rhythm of the heartbeat. Newer pacemakers can monitor blood temperature, breathing rate, and other factors and adjust the heart rate to changes in a person's activity. Pacemakers can be temporary or permanent. Temporary pacemakers are used to treat temporary heartbeat problems, such as a slow heartbeat due to heart attack, heart surgery, or an overdose of medicine. 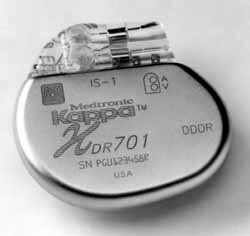 Temporary pacemakers are used in emergencies until a permanent pacemaker can be implanted or until the temporary condition goes away. A person with a temporary pacemaker will stay in the hospital as long as the pacemaker is in place. In this article, "pacemakers" refers to permanent devices, unless stated otherwise. Doctors also treat arrhythmias with another device called an implantable cardioverter defibrillator (ICD). An ICD is like a pacemaker in some ways, but it can use higher energy electrical pulses to treat certain dangerous types of arrhythmia. Doctors recommend pacemakers to patients for a number of reasons. The most common reason is when a patient's heart is beating too slow or there are long pauses between heartbeats. Using pacemakers to treat conditions not related to heart rhythm problems is becoming more common. Aging or heart disease damages the sinus node's ability to set the correct pace for the heartbeat. Such damage can make the heart beat too slow, or it can cause long pauses between heartbeats. The damage also can cause the heart rhythm to alternate between slow and fast. A person needs to take certain heart medicines (such as beta blockers), but these medicines slow down the heartbeat too much. The electrical signals between the heart's upper and lower chambers are partially or completely blocked or slowed down – a condition called heart block. Aging, damage to the heart from a heart attack, or other heart conditions can prevent electrical signals from reaching all the heart's chambers. A person often faints due to a slow heartbeat. For example, this may happen if the main artery in the neck that supplies the brain with blood is sensitive to pressure. If a person has this condition, just quickly turning his or her neck can cause the heart to beat slower than normal. When that happens, not enough blood may flow to the brain, causing the individual to faint. A person has had a medical procedure to treat an arrhythmia called atrial fibrillation. A pacemaker can help regulate the heartbeat after the procedure. To decide whether a pacemaker will benefit an individual, a doctor will consider any symptoms the patient has of an irregular heartbeat, such as dizziness, unexplained fainting, or shortness of breath. He or she also will consider whether the patient has a history of heart disease, what medicines they are currently taking, and the results of heart tests. A pacemaker won't be recommended unless the heart tests show that the patient has irregular heartbeats. A number of tests are used to detect an arrhythmia. A doctor may recommend some or all of these tests. This simple and painless test detects and records the electrical activity of the heart. An EKG shows how fast the heart is beating and the heart's rhythm (steady or irregular). It also records the strength and timing of electrical signals as they pass through each part of the heart. A Holter monitor, also called an ambulatory EKG, records the electrical signals of the heart for a full 24- or 48-hour period. The patient wears small patches called electrodes on the chest, which are connected by wires to a small, portable recorder. The recorder can be clipped to a belt, kept in a pocket, or hung around the neck. During the 24 or 48 hours, the person does his or her usual daily activities and keeps a notebook, noting any symptoms they have and the time they occur. Both the recorder and the notebook are returned to a doctor to read the results. The doctor can see how the heart was beating at the time the symptoms occurred. This test uses sound waves to create a moving picture of your heart. An echocardiogram shows the size and shape of the heart and how well the heart is pumping blood. The test can identify areas of heart muscle that aren't contracting normally or getting enough blood flow. For an electrophysiology study, a doctor threads a small, flexible wire from a blood vessel in the patient's arm or leg to the heart. The wire electrically stimulates the heart to see how its electrical system responds. The electrical stimulation helps to find where the heart's electrical system is damaged. Some heart problems are easier to diagnose when the heart is working harder and beating faster than when it's at rest. During stress testing, the patient exercises to make the heart work harder and beat faster while heart tests, such as an EKG or echocardiogram, are performed. 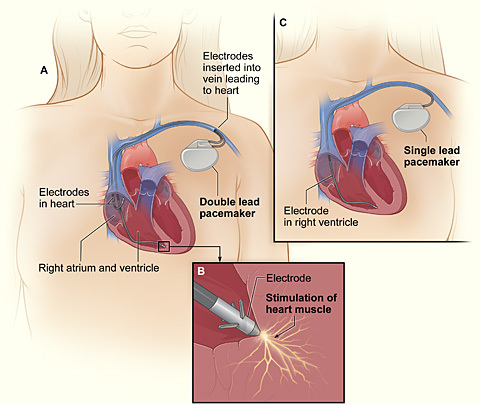 A pacemaker consists of a battery, a computerized generator, and wires with electrodes on one end. The battery powers the generator, and a thin metal box surrounds both it and the generator. The wires connect the generator to the heart. The pacemaker's generator sends the electrical pulses that correct or set the heart rhythm. A computer chip figures out what types of electrical pulses to send to the heart and when those pulses are needed. To do this, the computer chip uses the information it receives from the wires connected to the heart. It also may use information from sensors in the wires that detect the person's movement, blood temperature, breathing, or other factors that indicate his or her level of physical activity. That way, it can make the heart beat faster during exercise. The computer chip also records the heart's electrical activity and heart rhythms. A doctor will use these recordings to set the pacemaker so it works better at making sure there is a normal heart rhythm. A doctor can program the computer in the pacemaker without having to use needles or directly contacting the pacemaker. The wires in the pacemaker send electrical pulses to and from the heart and the generator. Pacemakers have one to three wires that are each placed in different chambers of the heart. The wires in a dual-chamber pacemaker carry pulses between the right atrium and the right ventricle and the generator. The pulses help coordinate the timing of these two chambers' contractions. The wires in a triple-chamber pacemaker are used for heart muscle weakness and carry pulses between an atrium and both ventricles and the generator. The pulses help coordinate the timing of the two ventricles with each other. There are two main types of programming for pacemakers – demand pacing and rate-responsive pacing. A demand pacemaker monitors the heart rhythm. It only electrically stimulates the heart if it's beating too slow or if it misses a beat. A rate-responsive pacemaker will speed up or slow down the heart rate depending on how active a person is. To do this, the rate-responsive pacemaker monitors the sinus node rate, breathing, blood temperature, or other factors to determine a person's activity level. Most people who need a pacemaker to continually set the pace of their heartbeat have rate-responsive pacemakers. Placement of a pacemaker requires minor surgery, which is usually done in a hospital or special heart treatment laboratory. The patient is given medicine right before the surgery that helps them relax and may make them fall nearly asleep. A doctor will give a local anesthetic so the patient feels nothing in the area where he or she puts the pacemaker. First, the doctor will place a needle in a large vein, usually near the shoulder opposite the dominant hand. The doctor will then use the needle to thread the pacemaker wires into a vein and to the correct location in the heart. An X-ray "movie" of the wires as they pass through the vein and into the heart will help the doctor place the wires. Once the wires are in place, the doctor will make a small cut into the skin of the chest or abdomen. He or she will then slip the pacemaker generator/battery box through the cut, place it just under the skin, and connect it to the wires that lead to the heart. Once the pacemaker is in place, the doctor will sew up the cut. The entire surgery takes a few hours. A patient can expect to stay in the hospital overnight so their heartbeat can be monitored and a doctor can make sure the pacemaker is working properly. The patient probably will have to arrange for a ride to and from the hospital. For a few days to weeks after surgery, there may be pain, swelling, or tenderness in the area where the pacemaker was placed. The pain is usually mild and often relieved by over-the-counter medicines. A doctor should be consulted before taking any pain medicines. A doctor also may ask the patient to avoid any vigorous activities and heavy lifting for about a month. Most people return to normal activities within a few days of having pacemaker surgery. These devices can disrupt the electrical signaling of the pacemaker and stop it from working properly. A person may not be able to tell whether their pacemaker has been affected. How likely a device is to disrupt the pacemaker depends on how long the person is exposed to it and how close it is to the pacemaker. To be on the safe side, some experts recommend not putting a cell phone in a shirt pocket over a pacemaker (if the phone is turned on). A person may want to hold the cell phone up to the ear that's opposite the site where the pacemaker was implanted. People with pacemakers can walk through security system metal detectors at normal pace. They also can be checked with a metal detector wand as long as it isn't held for too long over the pacemaker site. They should avoid sitting or standing close to a security system metal detector. Stay at least 2 feet away from industrial welders or electrical generators. Doctors, dentists, and medical technicians should be informed if a person has a pacemaker. Individuals with pacemakers also should notify airport screeners. A doctor can provide a card that states what kind of pacemaker it is. This should be carried at all times. In most cases, having a pacemaker won't limit a person from doing sports and exercise, including strenuous activities. They may need to avoid full-contact sports, such as football. Such contact could damage the pacemaker or shake loose the wires in the heart. A doctor should be consulted about how much and what kinds of physical activity are safe. To check the pacemaker, a doctor may ask a patient to come in for an office visit several times a year. Some pacemaker functions can be checked remotely through a telephone call or a computer connection to the Internet. A doctor also may ask a person to have an EKG (electrocardiogram) to monitor changes in the electrical activity of the heart. Pacemaker batteries last between 5 and 15 years, depending on how active the pacemaker is. A doctor will replace the generator along with the battery before the battery begins to run down. Replacement of the generator/battery is a less involved surgery than the original surgery to implant the pacemaker. The wires of the pacemaker also may need to be replaced eventually. A doctor can advise whether a pacemaker or its wires need replacing.